XML has become a popular data interchange and storage format, which in recent times has precipitated the rise of XML-enabled relational databases as well as native XML databases. This paper outlines a data definition and manipulation language for XML repositories that enables users to perform data management tasks such as creation and deletion of indices, collections and documents. The language proposed also provides the ability to perform queries, transformations and updates on the documents in the XML repository either singly or across an entire collection. A syntax for the language is presented as extensions to the W3C.s XML Query language (XQuery) and also as a new language with syntax borrowed heavily from SQL for the relational model and DL/1 of IBM.s IMS system for the hierarchical model. A prototype implementation of the language has been partially completed. Boag, S., Chamberlin, D., Fernandez, M.F., Florescu, D., Robie, J., Siméon, J., Stefanescu, M.: XQuery 1.0: An XML Query Language (Working Draft). 20 December 2001. http://www.w3.org/TR/2001/WD-xquery-20011220. Clark, J., DeRose, S.: XPath: XML Path Language (Version 1.0). 16 November 1999. http://www.w3.org/TR/1999/REC-xpath-19991116. Lehti, P.: Design and Implementation of a Data Manipulation Processor for an XML Query Language. 2001. http://www.lehti.de/beruf/diplomarbeit.pdf. Staken, K.: XML:DB Database API (Working Draft). 20 September 2001. http://www.xmldb.org/xapi/xapi-draft.html. Laux, A.: XUpdate-XML Update Language. 14 September 2000. http://www.xmldb.org/xupdate/xupdate-wd.html. Chamberlain, D., Fankhauser, P., Marchiori, M., Robie, J.: XQuery Requirements. 15 February 2002. http://www.w3.org/TR/2001/WD-xmlquery-req-20010215. Bray, T., Paoli, J., Sperberg-McQueen, C.M., Maler, E.: Extensible Markup Language (XML) 1.0 Second Edition. 6 October 2000. http://www.w3.org/TR/2000/REC-xml-20001006. Thompson, H.S., Beech, D., Maloney, M., Mendelsohn, N.: XML Schema Part 1: Structures. 2 May 2001. http://www.w3.org/TR/2001/REC-xmlschema-1-20010502/. Cowan, J., Tobin, R.: XML Information Set. 24 October 2001. http://www.w3.org/TR/2001/REC-xml-infoset-20011024. Bray, T., Hollander, A., Layman, A.: Namespaces in XML. 14 January 1999. http://www.w3.org/TR/1999/REC-xml-names-19990114. Fernández, M., Marsh, J., Nagy, M.: XQuery 1.0 and XPath 2.0 Data Model. 20 December 2001. http://www.w3.org/TR/2001/WD-query-datamodel-20011220/. Malhotra, A., Rys, M., Robie, J.: XML Syntax for XQuery 1.0 (XQueryX). 7 June 2001. http://www.w3.org/TR/2001/WD-xqueryx-20010607. Thompson, H.S., Frankston, C.: XML-Data reduced (version 0.21). 3 July 1998. http://www.ltg.ed.ac.uk/~ht/XMLData-Reduced.htm. Clark, J., Makoto, M.: Relax NG Specification. 3 December 2001. http://www.oasis-open.org/committees/relax-ng/spec-20011203.html. 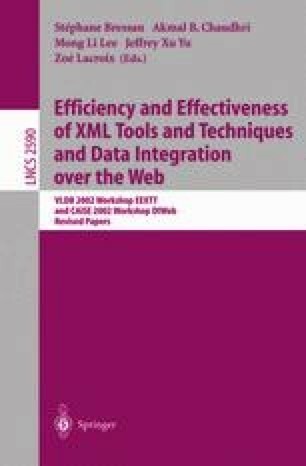 Malhotra, A., Melton, J., Robie, J., Walsh, N.: XQuery 1.0 and XPath 2.0 Functions and Operators. 7 Mar 2002. http://www.w3.org/TR/xquery-operators/. Biron, P.V., Malhotra, A.: XML Schema Part 2: Datatypes. http://www.w3.org/TR/2001/REC-xmlschema-2-20010502/.